The world that is Google is expansive. With dozens of services and solutions, getting your hands (and head) around all that they have to offer and use those services and solutions can be daunting. Even the most powerful of power users can get lost in the maze so the company has launched Google Tips. 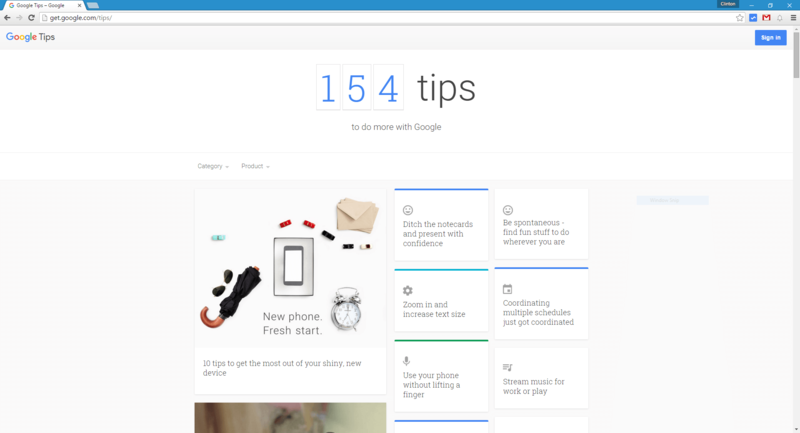 Google Tips is a website that has over 150 tips, tricks and how to’s to make your experience and use of their services and solutions easier. The tips range from doing like using an app to order groceries to finding your Android phone if you left it somewhere. There are tips that cover using Google Sheets, privacy settings and how to text hands free. It’s a pretty impressive start and something that I applaud Google for developing as more people turn to their services and solutions every day. that you didn’t know that could be a handy thing in your day-to-day. Given that there is a counter at the top of the page, I suspect we are only seeing the beginnings of this site. Given the vast amount of services that Google has to offer, there are thousands of tips and tricks available. It will be interesting to watch how they develop the site over time. Go give Google Tips a look and see what you think.